Glory and adventure await as you return to save ancient Egypt from certain doom in LUXOR: Amun Rising. Defeat the rebellious Princess of Megiddo before they overthrow the Pharaoh and plunge the Two Lands into chaos! The challenge will not be an easy one as you battle through 88 awesome and all-new levels. 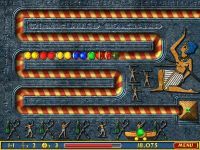 Use your mystical winged scarab to shoot magical spheres and destroy the approaching color spheres by making matches of three or more. Stop them all before they can reach the Pyramids at the ends of the path... or all of Egypt is doomed!